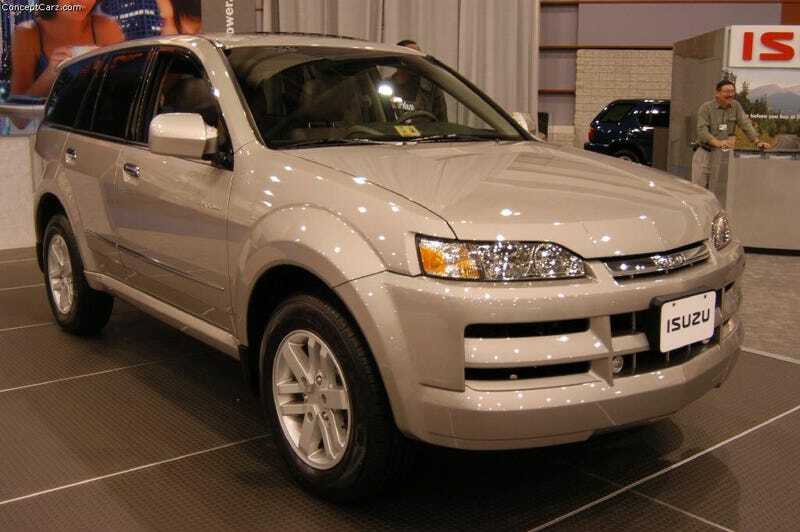 Debuting for the ‘01 model year, the Axiom was Isuzu’s answer to car based SUV’s like the Toyota Highlander. It replaced the Rodeo as Isuzu’s flagship SUV here in the States. Based on the same platform as the outgoing Rodeo, it was powered by a 3.5 liter V6 that initially put out 230 horses, but was bumped up to 250 in ‘04 along with a new transmission. In typical rugged Isuzu fashion, it was available with a 4 wheel drive system as well. It was built in Lafayette, Indiana at what was then called Subaru Isuzu Automotive Inc, a joint venture production plant by Subaru and Isuzu(weirdly the last gen Camry was produced here from ‘07-’16). Its strange name was the result of a contest Isuzu had to name the vehicle, with the winner getting his own Axiom. With its strange but handsome styling, and plain interior, the Axiom wasn’t well received by the buying public only staying on the market 3 years. It was replaced by the equally forgettable Chevy Trailblazer in a cheap suit Isuzu Ascender in 2004. Over its 3 years on the market, the Axiom spawned 3 sporty concepts to try to liven things up. Firstly, the above pictured Axiom XSF concept. Debuting at SEMA in 2001, it had a sporty body kit that was designed by Isuzu and fabricated by Italdesign’s California arm, Italdesign California (IDC). It came with the same 3.5 V6 as the regular Axiom, but in the XSF the V6 was fitted with a AutoRotor supercharger and a Laminova intercooler boosting power to 275 peak horsepower and 260 lb/ft of torque through was was described as a “sophisticated” 4 speed auto. Next up is something that might go over well today with the Nissan Murano CrossCabriolet/Range Rover Evoque convertible crowd the Axiom XSR from 2002. IDC had a hand in this one as well. No changes were made to the 3.5 V6 in this concept and it had the same 230 horses as the production version. Lastly was the Axiom XST which was exactly what it looked like: an Axiom pickup. With Italdesign having a hand in this as well, it had a midgate system to extend the bed length. The XST different from the other Axiom concepts in engine wise in that it was powered by a Isuzu 3.0 liter turbodiesel V6 that sadly was never used in production. Had Isuzu brought any of these into production, specifically the XST instead of the badge engineered i Series, the Axiom may have helped delay their US exit for a few more years.